Industrial Batteries and Chargers - Electric Vehicle Controllers Ltd.
E.V.C. 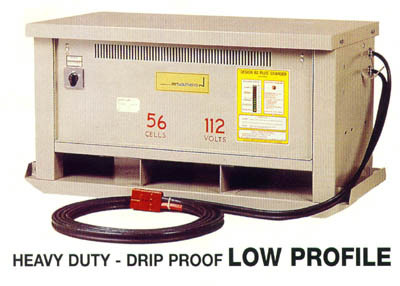 also distributes a complete line of Mine Locomotive Industrial batteries and chargers. Among these is the well-known Surrette battery - the only industrial deep discharge battery still being manufactured in Canada. Surrette started manufacturing batteries over 60 years ago with the desire not to be the largest, but the best. The Surrette Difference Positive active material is manufactured from a dense coarse oxide which is specially formulated for maximum life and performance. Surrette manufactures all its own oxide from pure lead. Most manufacturers purchase their oxide which is usually designed for automotive batteries. Not so with Surrette. 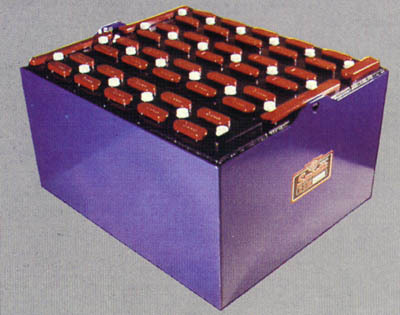 Staticon Mine and Industrial Battery Chargers charges all makes and types of lead acid batteries used in mine vehicles. THERE ARE NO CONSTRAINTS ON THE USERS' CHOICE OF BATTERY - NOW OR IN THE FUTURE. USER FRIENDLY • Simple to Operate - No special training required. • Quiet, convection cooled, efficient performance. • Your choice of charge program - from manual start to fully automatic 'Hands Off" charging. • Assures 100% recharge regardless of length of DC Cable (No arbitrary fîeld adjustment required). • Tangle free, twin flex DC Cable c/w sensing leads. • Bright color coded bargraph DC Ammeter - charge status has 120 ft. visibility. • Status display protected by recessed door and hood. • Designed for maintainability through front door.